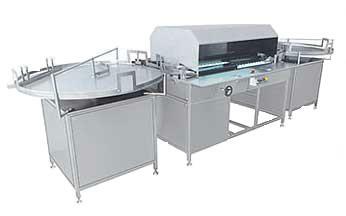 In process of operation of Automatic visual vial inspection machine, Vials are transferred to inspection machines after sealing has been performed. Machine operators sit in front of magnifying glass and inspect vials for any breakage or any other problems. The speed of this machine can be maintained by A.C. frequency drive. It has in-built auto rejection system. Power Supply 230 Volts, Single Phase,50 Hz. Electric Supply 230 Volts, Single Phase,50 Hz.